The report of the Thirty - third Session of the Codex Committee on Food Hygiene (CCFH) is attached. It will be considered by the Twenty-fourth Session of the Codex Alimentarius Commission, Geneva, 2001. 1. Draft Code of Hygienic Practice for the Primary Production and Packing of Fresh Fruits and Vegetables at Step 5, ALINORM 01/13A, paras 31-82 and Appendix II. 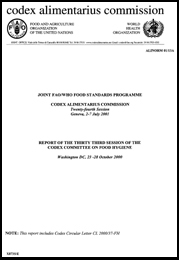 Governments wishing to propose amendments to or comment on the above matter should do so in writing in conformity with the Uniform Procedure for the Elaboration of Codex Standards and Related Texts at Step 5 (Procedural Manual of the Codex Alimentarius Commission, Eleventh Edition, page 22). Comments or proposed amendments should be sent to the Secretary, Codex Alimentarius Commission, Joint FAO/WHO Food Standards Programme, FAO, Viale delle Terme di Caracalla, 00100 Rome, Italy (fax: +39 (06) 570.54593 or E-mail: codex@fao.org) before 1 April 2001. 1. Food Safety Objectives (FSO), as presented in Section 5.2.1.1 of CX/FH 00/6 of the Proposed Draft Principles and Guidelines for the Conduct of Microbiological Risk Management. See also paras 83-95 of this report. While considering the Proposed Draft Principles and Guidelines for the Conduct of Microbiological Risk Management at Step 4 the Committee agreed to request the Governments and interested international organizations to provide information and views of Food Safety Objectives as presented in Section 5.2.1.1 of CX/FH 00/6 and, if possible, examples of FSOs. Comments should be forwarded to Dr Claire Gaudot, Directrice de lhygiène des ailments, Ministère de lagriculture et de la pêche, 251, rue de Vaugirard, 75732 Paris Cedex 15, Fax: 0149 55 56 80, E-mail: claire.gaudot@argiculture.gouv.fr with a copy to Secretary, Codex Alimentarius Commission, Joint FAO/WHO Food Standards Programme, FAO, Viale delle Terme di Caracalla, 00100 Rome, Italy, by Fax: +39 (06) 570.54593 or E-mail: Codex@fao.org before 1 April 2001. 2. Proposed Draft Guidelines for the Control of Listeria monocytogenes in Foods. See also paras 111-119 of this report. Member Governments and interested international organizations are invited to provide their comments on the current document CX/FH 00/9. Comments should be forwarded to Dr Hans Dieter Boehm, Head Division Food Hygiene and Food Trade, Federal Ministry of Health, Propsthof 78A, D-53121 Bonn, Germany, Fax: (49) 228-941-4944, E-mail: hans.boehm@bmvg.bund.de with a copy to Secretary, Codex Alimentarius Commission, Joint FAO/WHO Food Standards Programme, FAO, Viale delle Terme di Caracalla, 00100 Rome, Italy, by Fax: +39 (06) 570.54593 or E-mail: Codex@fao.org before 1 April 2001. 3. Development of the Guidelines on the Application of HACCP in Small and/or Less Developed Businesses. See also paras 120-133 of this report. While considering the Discussion paper on the Application of HACCP in small and/or Less developed Businesses (SLDBs), the Committee concluded that the document was useful, and there was general support to further elaborate it, therefore agreed to amendment to the existing HACCP Guidelines without altering the seven HACCP principles. Member Governments, especially from developing countries, and interested international organizations are invited to provide their comments on the current document CX/FH 00/10 on how to further develop the Guidelines. Comments should be forwarded to Dr Jaap Jansen, Ministry of Health, Welfare and Sports, P.O. Box 16108, 2500 BC Den Haag, The Netherlands, Fax: (31) 70 340-5435, E-mail: jaap.jansen@kvw.nl with a copy to Secretary, Codex Alimentarius Commission, Joint FAO/WHO Food Standards Programme, FAO, Viale delle Terme di Caracalla, 00100 Rome, Italy, by Fax: +39 (06) 570.54593 or E-mail: Codex@fao.org before 1 April 2001. Governments and interested international organizations are invited to provide their comment on the above subject matter and should do so in writing to the Secretary, Codex Alimentarius Commission, Joint FAO/WHO Food Standards Programme, FAO, Viale delle Terme di Caracalla, 00100 Rome, Italy (fax: +39 (06) 570.54593 or E-mail: codex@fao.org) before 1 February 2001.